Credit union first mortgage originations are up 36% year-to-date in third quarter 2009 over 2008, yet outstanding first mortgages only grew 5.8% ("only" being a relative term; outstanding growth of 1-4 family residential mortgages at FDIC-insured institutions was -8.3%). In addition to significant refinance volume, this discrepancy is accounted for when considering sales of first mortgages on the secondary market. Year-to-date sales volume as of September 30, 2009 is triple the volume of 2008. Falling interest rates prompted this rapid increase in sales on the secondary market, as credit unions do not want to keep long-term assets with low interest rates on their books. 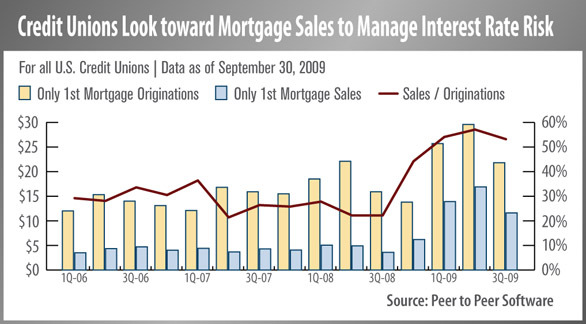 The ratio of first mortgage sales to originations leapt from 22% to 44% in the last quarter of 2008. During that quarter, the average 30 year fixed rate mortgage fell below 6%; it peaked in second quarter of 2009 at 57% as mortgage rates fall below 5%. Mortgage rates bottomed at 4.71% in December after a temporary rebound in third quarter, so if this sales trend holds, credit unions likely finished the year selling more than half of their first mortgage originations. Preliminary 4th quarter mortgage data is available and will be covered in Build Mortgage Market Share in 2010, a live webinar on January 28 at 2 pm (EST). Timely data and credit union success stories will provide your credit union with valuable tools to excel in the mortgage market in 2010.